The ‘war to end all wars’ was still raging in the early part of 1918 when a group of women in Sedgefield banded together to form the then village’s Women’s Institute. In the century since those dark days, the WI has played an important and increasingly-popular role in community life. And on October 10th, members of the Women’s Institute will celebrate the contribution they have made in and around the Sedgefield area during the past century with a special service at St Edmund’s Church they have labelled “It’s never too late to say thank-you”. To mark their centenary, WI members have produced an eye-catching banner with a list of all their activities on one side and the names of 2018 members on the reverse. It was made by a team headed by Kathleen Heasman. 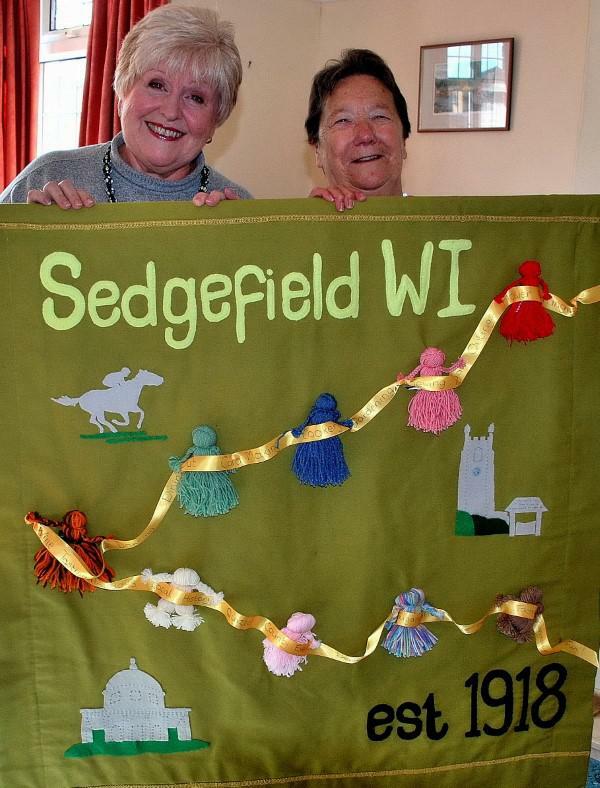 Audrey is pictured (right) with the banner and Sedgefield WI Secretary Christine Dunn. Guests at the service, which begins at 1.45pm, will be the Rectory Row School Choir, the Mayor of Sedgefield (Cllr Mrs Mavis Wayman), and Mrs Judith Alderson of Bishop Middleham, current Chairman of the County Durham Federation of WI.